As The Legal Genealogist mentioned yesterday, this is the week when hundreds of genealogists from across the country and even the world will be descending on Raleigh, North Carolina, for the annual conference of the National Genealogical Society. This four-day, multi-track conference is one of the highpoints of the genealogy year, and gives all of us the chance to see what’s happening in the field, meet up with old friends and make new ones, and revel in the joy of being around like-minded people as obsessed with genealogy as we are. And we all have the change to learn and grow and develop as genealogists, by learning as much as we can about how to do genealogy right: what the methodology is to be a genealogy and how to apply those tools to our own research. We can learn even if we can’t make it to Raleigh. 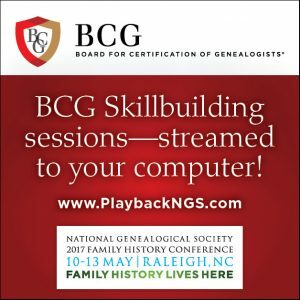 Just as there is an entire day of livestreamed lectures on DNA being offered as part of this year’s NGS conference, there is also an entire day of livestreamed talks on building our skills as genealogists, co-sponsored by the Board for Certification of Genealogists in its skillbuilding track. The neat thing about the livestreaming package is, you don’t have to be able to sit and watch it in real time. You can do that, if your schedule allows, but if not then about 48 hours later, the livestreamed sessions will be online for those who’ve subscribed — and subscribers can just log-in and watch them. The livestreamed sessions begin at 8 a.m. with Michael Hait, CG, on “One Dollar and Natural Love and Affection: Analyzing Deeds Deeply”: This lecture goes beyond the obvious to explore the rich variety of evidence that deeds, mortgages, and other instruments offer regarding relationships and identity. At 9:30 a.m., Barbara Vines Little, CG, FNGS, FUGA, FVGS, will explain about “Recreating your Ancestor’s Neighborhood”: When researchers hit a brick wall, the advice is usually the same—consider the neighbors. But first, we have to find them. At 11 a.m., we can hear from Elizabeth Shown Mills, CG, CGL, FASG, FNGS, FUGA, on “What’s the Evidence? How to Probe Documents Beyond the Obvious”: Evidence is more than “facts” or words on paper. It’s both tangible and intangible, singular and collective, mental and emotional. This session demonstrates why. At 2:30 p.m., Gail Jackson Miller, CG, will help us all understand “The Genealogical Proof Summary: What It Is and Is Not”: Learn to logically organize and present your evidence to meet current standards. Improve and simplify this important step in the research process. And last but hardly least, at 4 p.m., Thomas Wright Jones, CG, CGL, PhD, FASG, FUGS, FNGS, will present “Converting a Bunch of Information into a Credible Conclusion”: Thorough research often yields disparate evidence items. Genealogists can organize the mixture, assess it as a whole, and convert the assemblage into a provable conclusion. The skillbuilding track is a great way to learn about methodology if you can attend the conference — and now, with livestreaming, even if you can’t. And if certification is something you’re interested in, don’t miss the BCG Certification Seminar, starting at 9:30 am on Thursday (Session T211), where BCG leaders Laurel Baty, CG, Jeanne Larzalere Bloom, CG, and Michael Ramage, CG, will explain all of the ins and outs of the certification process.